We will conduct an in-depth review of your current security policy/procedure documents and evaluate them in accordance with the most up to date strategies the security industry has to offer. In addition to reviewing current documents, we will also work closely with key members of your team who are responsible for carrying out the organization’s specific security policies and procedures, with the goal of seeking their insight and input regarding the unique needs of your industry and professional culture. 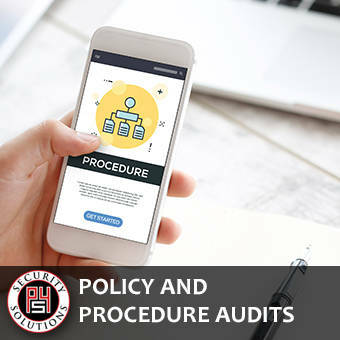 Upon completion of our thorough assessment of your policy and procedures manuals, we will issue a set of specific recommendations, designed to bridge any security gaps or update any areas in need of modernization. You can count on the dedicated professionals at P4 Security Solutions to help you bring your vital security policies and procedures up to the highest level of quality and effectiveness.